Do you ladies highlight your face? If not you should and this compact is the best there is! It comes in beautiful shades ranging from shimmery white to shimmery brown. This compact is so versatile because you can use it to highlight, as eye shadow, blush or even on your lips with a clear chapstick! The key is learning how to highlight properly! Take the light shades at the top (I use the first two) and make a C around your eyes, underneath the eye on and around the outside over the eyebrow (not a full circle remember just a C shape). Also apply this color combo down the bridge of your nose and a slight dot over your cupids brown (the little dip in your lip). Next take the bottom three colors, focusing most on the brown and such in your cheeks like you are making a fish face. Apply the dark color to the sucked in spot, right below your check bone. Also apply it to the sides of your temples and around your jaw line. Also do not forget to blend!! Make sure there are no dark or really light lines on your face. Finally, you can use all of these colors as a beautiful eye shadow palate. 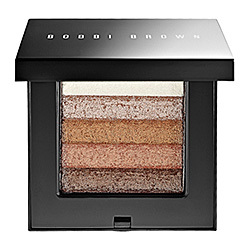 I really love this shimmer brick for the summertime it is so light and beautiful. This product is so great because even though it is on the higher side, $39, it can be used for so many different areas of your face. Also, many of my girlfriends have the same shimmer brick color and some of them have more fair skin tone then I do and some are much darker. Its perfect for everyone!